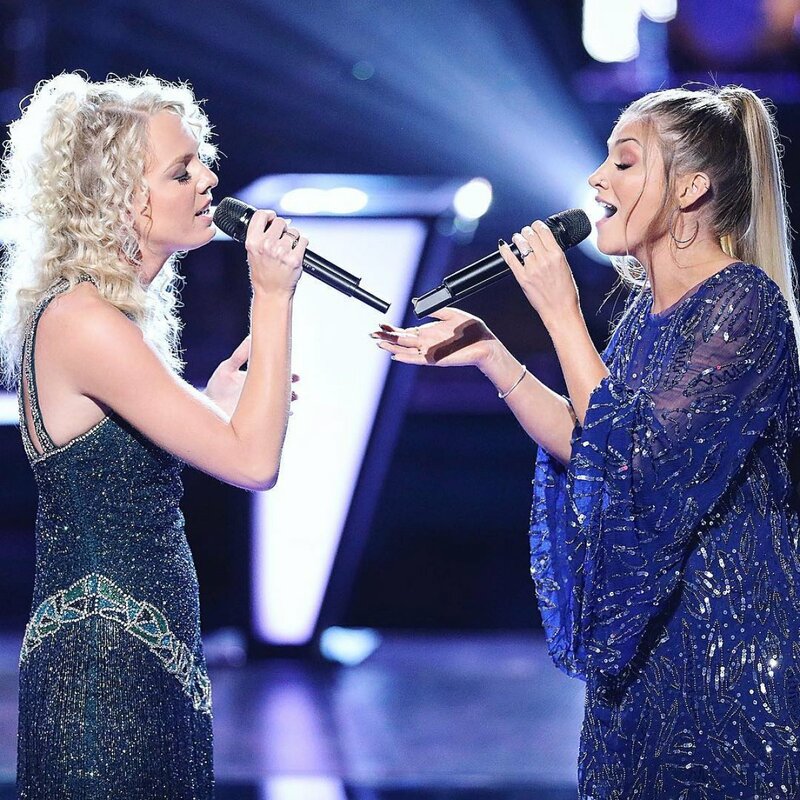 'The Voice' recap: Battle Round continues, winners include Kymberli Joye, Katrina Cain, Tyke James and more! The Voice continued its Season 15 Battle Round with seven artists advancing during Tuesday night's one-hour episode on NBC. Coaches Blake Shelton, Adam Levine, Jennifer Hudson and Kelly Clarkson were each shown pitting two members of his or her team against each other at a time, and by the end of the duet, only one person would remain in the competition unless an opposing coach opted to "steal" the losing artist in the matchup. The artists who won their Battles on Tuesday night's show were Kymberli Joye, a 26-year-old from Windsor, CT; Steve Memmolo, a 35-year-old from Boston, MA; Tyke James, a 17-year-old from Laie, HI; Katrina Cain, 29-year-old from Denton, TX; Chris Kroeze, a 27-year-old from Barron, WI; and Mike Parker, a 23-year-old from Gainesville, VA.
And the artist who was stolen by another coach after losing her Battle was Natasia Greycloud, a 29-year-old from Nashville, TN. The first Battle of the night was Kymberli paired up with OneUp, a duo comprised of 35-year-old guys Adam and Jerome from Manhattan, NY, on behalf of their coach Kelly Clarkson and team advisor Thomas Rhett. Kymberli and OneUp performed "Mercy" by Shawn Mendes and received a standing ovation from Kelly and Jennifer. Adam said Kymberli stood up against the duo and "crushed it," adding that he wouldn't be surprised by Kelly's decision either way. Jennifer pointed out the individuals should become a trio. Kelly called them all "phenomenal vocalists" and said her choice came down to whom surprised her the most -- even though everyone managed to do that. "This is based on this performance and the Blinds. The winner of this Battle is Kymberli," Kelly announced, before telling the cameras she's a "powerhouse" with incredible range and colors. Two members of Adam's team was up next, and they got to work with advisor CeeLo Green. They were Anthony Arya, a 15-year-old from Santa Cruz, CA, and Steve who performed Pure Prairie League's "Amie." Jennifer said Anthony "held his own" and showed he has true potential but Steve came out of the gate swinging. Blake noted the song fit Anthony's wheelhouse a little bit better but Steve "stepped up to the plate." Adam admitted this Battle was a tough one for him. He said Anthony is a warm and beautiful person, while Steve is a very seasoned and talented artist. With that being said, Adam chose to keep Steve on his team. For another Battle representing "Team Adam," Jarred Matthew, a 31-year-old from San Diego, CA, sang a duet of "She's Always a Woman" with Tyke. The singers were so different. Adam could see Tyke crushing it and becoming a very successful singer, so he named the "Tarzan" look-a-like, according to Kelly, the winner of the Battle. The next Battle belonged to Chris Kroeze and Mercedes Ferreira-Dias on behalf of "Team Blake" and his advisor Keith Urban. The pair took the stage with "Back In the High Life Again." Jennifer said Mercedes' voice is "so distinctive" but she loved Chris' raspy tone. Adam added Chris was amazing and so were the harmonies. Blake told Mercedes she blew him away and The Voice exists because of a voice like hers, but he went with his gut feeling and decided Chris had won the Battle because he sounds like Martina McBride but looks like Chris Stapleton. The next pairing for "Team Blake" featured Katrina and Rachel Messer, a 19-year-old from Fort Gay, WV, and they sang "Angel" by Sarah McLachlan. Both ladies internalized the song and handled it gracefully, but Blake determined Katrina had won the Battle. Blake said Katrina has an ability to convey a store through her vocals. It then became time for a "Team Jennifer" Battle between Mike Parker, a 23-year-old from Gainesville, VA, and Natasia. Halsey served as their advisor. The couple of artists belted out "Gravity" by John Mayer, and Kelly gave them both a standing ovation. Kelly laughed about how Jennifer was "so screwed" because they sounded unbelievable. Kelly said Mike's a star but Natasia's runs and range were very impressive. Adam said the artists made the song come to life, and Blake noted Mike was a pleasant surprise. Blake, however, couldn't sell Natasia short because she attacked the song. In the end, Jennifer explained they both brought something very special to the table -- Mike's choices and Natasia's "outstanding instrument." Jennifer admitted they were "evenly great" so she went with strategy and advanced Mike. But this wasn't the end of the road for Natasia, as Kelly opted to steal her for her own team. Kelly said Natasia is everything she'd want in a singer. 'Married at First Sight' finale: Decision Day couples shockers! Who decided to stay together or divorce?